A shot of Nikki Smith during the 2018 Bozeman Ice Festival. Photo credit Sarah Klintworth. Last week I was privileged to be able to teach at the Bozeman Ice Fest. People from all over gather to visit Hyalite Canyon, just outside of Bozeman, Montana, and spend the week learning from one another. For the athletes/instructors, guides and companies, it’s a family reunion of sorts. We get to see each other, catch up and can share our experience and love for the outdoors with so many new climbers. It’s fantastic to watch as the students learn throughout their clinic. Improving drastically as the day goes on. Building confidence as they overcome their fears or trepidations. It’s something I’ll never tire of! But it’s not just the students who learn and grow. The 2018 Bozeman Ice Fest was my first year teaching as myself. The @bozemanicefest and my sponsors Grivel, Beal and Cilo Gear, supported me by adding “Queer Friendly” 🏳️‍🌈 in the title of my clinics. I want to create a safe space for anyone who has been too afraid to come out to try climbing because of who they are. I was nervous about the reaction and a little apprehensive as I started the introductions to each clinic asking everyone to give their pronouns. Something most had never experienced, and I had never asked of others before. Throughout the day some of the students would come to me privately to ask questions about why we shared our pronouns. For years, I was afraid of the reaction I’d get from the climbing community if I revealed who I really was. Although my photos might not reveal that I’m transgender, I still have a deep voice and am 6’ 4”. I’m commonly addressed as Sir, referenced as he or him. People often assume someone’s gender based on superficial traits. It’s uncomfortable. It can be extremely disheartening as misgendering, stares, pointing and laughing, and harassment is a daily occurrence for many trans people. By asking everyone to give their pronouns in a setting like these clinics, nobody is forced to be the only one who is different. Nobody has to spend the day being referred to as the wrong gender because they were too embarrassed or afraid to speak out. From the start, we are all on equal footing as nobody has to assume our identity. For many people at these fests, I’m the first transgender person they “knowingly” have met. Some days it feels like a heavy burden, but it’s one I gladly take on. I’m so happy to finally let everyone get to know the real me and want to try to make it safer for others to do the same. Thanks to everyone at the fest for their kindness and generosity. I had a blast and can’t wait for the next one! This blog post originated as an instagram post by Nikki on her page @pullphoto. Nikki Smith is an athlete for Grivel, Beal Ropes, Cilo Gear, and others. 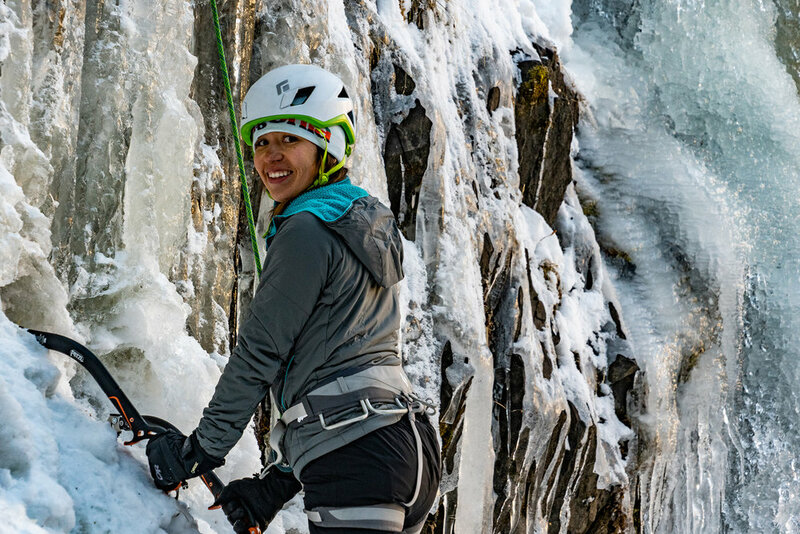 She has been a member of the Bozeman Ice Festival family for years and we fully support her initiatives to make climbing a more inclusive space. Nikki Smith teaching proper ice climbing technique. Photo credit Sarah Klintworth. Four stories from Yosemite Valley that will capture your imagination and inspire you! Fred Padula and Glen Denny's 1978 masterpiece. The film follows three climbers as they do the 3000-feet (900 m) vertical ascent of the Nose, a classic big-wall climb. A fourth climber follows the group and films their ascent but is never seen in the movie. American rock climber and mountaineer Conrad Anker and his mentee, a cancer survivor named Alex Wildman, as they attempt to scale El Capitan in Yosemite, California. Join us during the Adventure Film Festival Saturday December 8th. ce climbing technique is our focal point and you will be learning from the pros then put the climbing lessons in to action. Each day will be filled with continual feedback, instruction, and as much climbing as possible. Participants will walk away from our 2-day Introduction to Ice Climbing course with a solid ice climbing foundation; including the safety, knowledge, skills, and techniques needed to enjoy the wild and wonderful sport of ice climbing. 9-hour Introduction to Avalanche Course is designed specifically for those traveling by foot (not with skis or snowmobiles) in avalanche terrain. The field-course will focus specifically to ice climbers, the class room session will also apply to hunters, snowshoers, etc. Specific emphasis and additional focus on ice climbing specific dangers. In the field we will focus on making safe decisions on the fly in terrain and situations encountered by ice climbers where risks may be small isolated snow pockets in cliffy terrain or terrain thousands of feet above our climbing objectives. Head over to mtalpine.com to check out the other options available. Lisa Verwys is an ice climber, back-country skier, and trail runner who lives in Bozeman, Montana. She learned to ice climb at the Bozeman Ice Festival and is an active member of the outdoor community as well as the Registrar & Collections Manager for the Museum of the Rockies. What year did you take a clinic? Which clinic did you take? My first clinic was in December 2010 and I took Intro to Ice Climbing on Friday, which was “women’s day.” I’ve taken several clinics since then, including Women’s Intermediate Ice, Leaving the Nest, and Mixed Master. Lisa climbing a mixed line during the Bozeman Ice Fest. At the time (2010), I don’t think that the Ice Fest had any backpack demos- or maybe I just didn’t see the packs! So when I got all my fun demo gear home I realized that I didn’t own a backpack big enough to carry everything- all I had was a tiny mountain biking pack. I ended up borrowing a Jansport backpack at the last minute from a friend, and that’s how I carried all my gear up to G1. Did it all fit? Not really. Did I look totally ridiculous? Yes. Did anyone care? Nope! The other memorable gear mishap from my first day was that I didn’t have any idea of how to layer, and I didn’t know that I needed a big warm puffy for standing around. So I basically froze all day and yet I still came back for more. Did you have any ice climbing experience beforehand? I had never ice climbed! I had just moved to Bozeman about 7 months prior. I grew up in southwest Michigan so my only winter sport was downhill skiing. But I love winter and it sounded like a great opportunity to try something new without having to invest in any gear. Lisa climbing Genesis One. Commonly referred to as G1 this is one of the most popular crag’s in Hyalite. 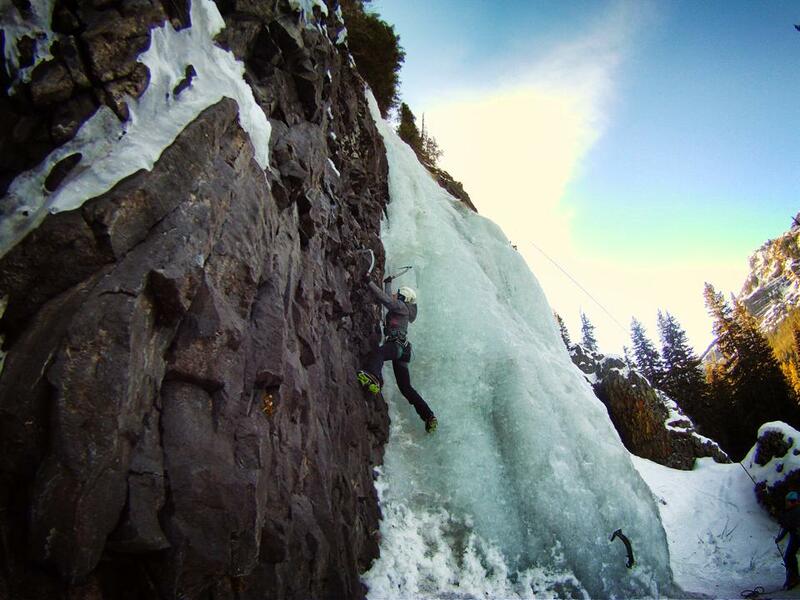 What drew you to ice climbing? Honestly I just thought it looked really amazing. The idea that people could climb frozen waterfalls had never even crossed my mind, although now I know that people climb in Michigan. I figured even if I hated it, at least I could say I tried it. What did you take away from the Women’s clinic? Really sore arms and back muscles! Just a quick plug here- I love, love, love the women’s clinics. I mostly climb with men throughout the season but there is something really special and really supportive about being out surrounded by women. I have taken mixed gender BIF clinics and those are also a blast, but the learning environment is totally different and amazing on women’s day. Mostly what I took away from the first day was a basic understanding of how to not totally flail around on the ice and a drive to figure out how I could find a way to meet more climbers & do more ice climbing. What is your favorite climb in Hyalite? Oh lord, can anyone answer this question? I’m a fan of the Matrix, Champagne Sherbet, and Silken Skein. I’d like to try Horsetail Falls again- I was up there once but it wasn’t quite in shape enough for us to feel comfortable climbing it. After the clinic what did your climbing progression look like? My first season I only climbed twice, but by the next season I had started dating an ice climber (I am a total Bozeman dating cliche, I know) and since I could borrow a lot of his gear, I started climbing quite a bit more and slowly started buying gear. I invested in my own boots in 2011 but didn’t get tools until 2012, or crampons until 2013. Anyway, I spent the first few seasons working on technique and getting comfortable being on ice, reading ice, understanding how ice changes over the course of a season & based on the weather. I started leading in 2013 (my first lead was on Upper Green Sleeves), and since then I’ve still been working on being comfortable on lead and also being a good partner when seconding. I still only lead up to WI3+, but I’m usually able to follow up to WI 4+/5. In the past few years I’ve really started to enjoy the challenge of mixed climbing. The same thing that drew me to climbing in the first place- I think ice climbing is the most aesthetically beautiful sport. I love coming around a corner and seeing a huge flow of blue or green ice. And I also love how the cold can turn small seeps into big climbs- it’s like a hidden world opens up in the winter. I also like to set goals each winter for climbing- usually a new climb to lead and also a “push your limits” type of goal, like trying a tougher mixed climb or a steeper or more sustained ice climb. Tell us about your Live Your Dream grant project last year? Any future projects you want to share? Lisa and Jamie Lichon skiing in Yellowstone . January 2018. That was actually my second LYD grant- the AAC has been generous to me! The first grant I received was to climb Granite Peak- and that money actually bought me my ice climbing rope. This last grant was to attempt a back-country ski traverse north to south through Yellowstone. We unfortunately got stopped by a pretty intense winter storm about 20 miles in to our trip, with over a week of -30 to -50 degree weather, huge amounts of new snow, and high winds. After being stuck for several days, we had to abandon our attempt (unfortunately when you work full-time, you can’t always wait out the weather! ), but we have it on our radar to try again someday. I’m almost always scheming some new outdoor project. I don’t always succeed at them, but it’s fun to get out there and try. I haven’t come up with a 2019 project yet, but there are some skiing & climbing objectives in the Tetons that I’ve had my eye on, so 2019 may be the year of the Tetons! 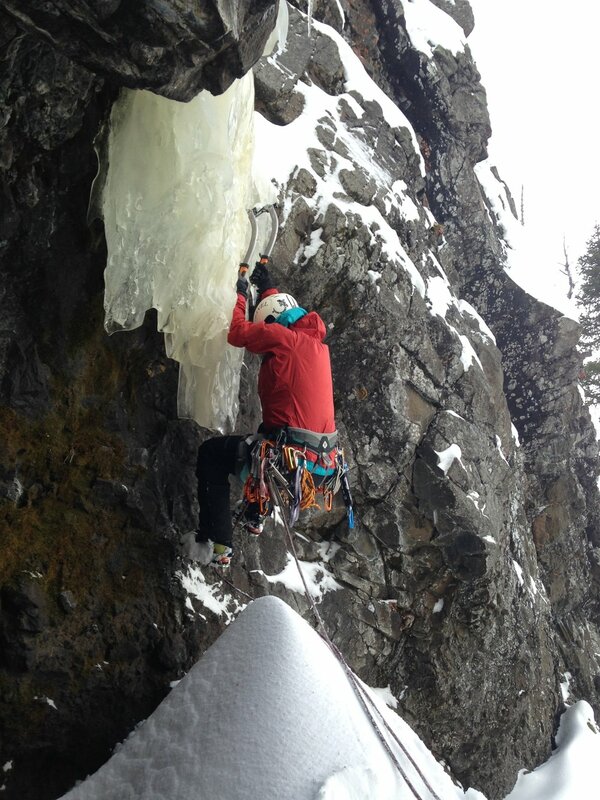 How does ice climbing experience support your other sports? Backcountry skiing, rock climbing, trail running? The funny thing is, I actually don’t rock climb! The heights in rock climbing scare me, but ice doesn’t. I’m not sure how to explain that one, but there you have it. I think most outdoor sports rely on a lot of the same principles, so they all support each other. Assessing safety, picking a smart line or a route, ability to adapt when things aren’t going the way you thought they would, communicating well and often, learning to use your energy wisely, understanding the benefits and negatives of fear, and learning to cope with fear. Physically, being consistently active throughout the year makes the transitions from sport to sport easier as well. I am able to advance more in each season when I have a fitness base rather than starting from scratch. Any advice for beginners looking to get into the sport? Lisa’s advice for getting into ice climbing. Take a clinic! Seriously. They’re super fun and you learn a ton right away. I also think it’s good to remember that you can make do with a lot of re-purposed or older gear for a while as you’re getting into the sport. Ice climbing is expensive, but you don’t need the newest tools or crampons or a whole new outerwear wardrobe. You can wear ski boots and your insulated snow pants (but be warned that you will snag ‘em with your crampons). I would not recommend carrying a Jansport, but if that’s what you’ve got then go for it! Lisa upgraded from her friend’s Jansport to a Mammut Trea Guide 40+7 backpack. How can we follow along with your adventures? You can find me on instagram at @verwys - and if anyone wants to go on an adventure, I’m open to that too! The Bozeman Ice Fest has some excellent backpack sponsors so make sure you check out the backpacks available from Mystery Ranch, Cilogear, Hyperlite, and others! Thanks for sharing your story Lisa! If you have a Bozeman Ice Fest story you’d like to share email us. BOZEMAN, Montana – Friends of Hyalite is proud to announce a new organizational structure for the annual Bozeman Ice Climbing Festival (Ice Fest). Every December, Ice Fest organizes instructional clinics for all abilities in Hyalite Canyon along with evening events and films at the Emerson Cultural Center. Friends of Hyalite inherited the Ice Fest in 2013 when the local businesses that had co-founded the Ice Fest were no longer able to manage the event. Due to rapid expansion facilitated by road plowing and the World Cup climbing competitions Ice Fest hosted between 2012 and 2015, the growing demands of the five-day event needed the added structure provided by Friends of Hyalite. The 2017 Ice Fest drew participants from 25 states plus Canada, taught ice climbing to more than 270 people ages 10 to 72 with over 2,500 attendees over the course of event. Ice Fest has grown beyond the mission of Friends of Hyalite, which is dedicated to stewardship of, access to, and support for year-round recreation in Hyalite Canyon. Friends of Hyalite has transferred ownership and operation of the Ice Fest to a new non-profit organization called the “Ice Climbing Alliance.” Long-time Ice Fest Director Joe Josephson, serves on the board of directors of the Ice Climbing Alliance (ICA) and will continue to lead the Ice Fest until a new Festival Director is named. “This transition is mutually welcomed and has been in the works for some time,” said Hilary Eisen, Board President for Friends of Hyalite. Josephson stepped down as Friends Executive Director in 2017 and recently left the Friends board to form the ICA along with Bozeman residents and climbers Dirk Tyler and Scott Lawson. “This represents an important evolution for the future of both Ice Fest and Friends of Hyalite,” says Josephson who co-founded Friends in 2010 and has been involved in Ice Fest since its inception in 1996 and Director since 2006. “Road plowing in Hyalite is what allowed the Festival to grow to its current place as one of the largest events of its kind in the world. Keeping Hyalite open is in our DNA and raising awareness for public land access and funds for road plowing will always be the top priority for Ice Fest,” continues Josephson. Since 2012, Ice Fest has raised more than $31,500 for the road-plowing fund, which costs on average more than $20,000 per winter. The overall plowing costs are shared through a unique collaboration between the US Forest Service, Gallatin County, and Friends of Hyalite - which contributes between $8,000-$13,000 per year in public support, in addition to applying for grants when available. Friends of Hyalite was originally set up to support the US Forest Service on a wide variety of growing needs in managing Hyalite Canyon. In addition to winter road plowing, these needs include clean up days, volunteer support, visitor use research, and other stewardship projects. Friends of Hyalite’s recent annual spring clean-up on May 12 drew over 100 volunteers who on average removed four to six tons of garbage from Hyalite every six months. ”The Hyalite watershed continues to be one of the most popular and heaviest recreated areas in the state of Montana” says Bozeman District Ranger Corey Lewellen, “Having a dedicated Friends group helps us address and manage the ever-growing demand of recreation use in the watershed, and we look forward to our continued partnership with Friends of Hyalite.” The Bozeman Ranger District administers the special use permit to operate the Ice Fest in Hyalite Canyon on the Custer Gallatin National Forest. The transition into separate non-profit organizations is supported unanimously by the Forest Service, boards for both Friends and ICA, as well as Ice Fest sponsors. This maturation allows both groups to more effectively pursue their own unique public benefit purposes. “This transition will allow Friends of Hyalite to expand our stewardship programs year-around, provide greater support to the Forest Service, and focus on new outreach into the community.” says Josh Fairchilds, Executive Director of Friends of Hyalite. Friends of Hyalite is a 501c3 non-profit organization dedicated to stewardship of, access to, and support for year-round recreation in Hyalite Canyon. Friends publish summer and winter recreation trail maps specific to Hyalite Canyon, available at local outdoor retailers. For more information visit www.hyalite.org or contact Friends at friendsofhyalite@gmail.com. Like any great photo, it takes a team approach from both a climber and the photographer. Below are both impressions of their RAB jackets while on the highest and hardest route in Hyalite. When I climbed the Conrad Anker and Kris Erickson’s Hyalite test piece “The Nutcracker”, I wore the RAB Latok Alpine Jacket. When it got windy or wet or cold, I’d cinch down on the draw cords on either side of the hood. Another clever feature I really liked was the fleece lining on the inside of the collar. Anytime the Hyalite wind did it’s best to dampen our spirits, I could comfortably tuck my chin to brave off the spindrift. There’s a cord on the back of the hood so I could keep it snug to my helmet while holding the wired visor in place. This kept the water spraying off nearby “Winter Dance” from spraying into the hood. The cool thing was, even with the hood cinched up, I had free range of movement with my head. I could crane my neck up at the over hanging choss without a fight. There’s also a fleece liner at the back of the neck but I didn’t really notice it. Maybe that’s the point. Maybe it was helping keep my neck warm. On the descent, while guessing our way around small cliffs in waist deep snow, I was able to open the enormous pit zips to cool down without having to stop and shed layers. The jacket I wore was a full size too big for me. Usually that means the jacket is baggy and puffs out blocking my view of the harness gear loops. But I was able to prevent that by cinching down on the waist pull cords making it nice and snug around my torso. By being able to customize the fit, I was able to climb without thinking about the jacket. It was a real treat to not be distracted by water dripping down my arms and not having to fight the hood and I could see my gear loops. Finally, I could focus on insanely pumped forearms and being terrified. “Winter Dance” (M8, WI7) and “Nutcracker” are wet routes. Water constantly free falls off the headwall in a steady stream that you can watch blow around. Updrafts blowing water back up creates wild features of upward forming ice that defy logic and gravity. But this time, for once, I stayed dry. The stupid pack was soaked but the water beaded up on the jacket and rolled off. The cuffs cinched down around my gloves keeping water from rolling down arms while they flailed wildly overhead on the crux ice pitch that was essentially getting rained on. Overall I found the Latok Alpine Jacket to pretty friggin’ rad. It’s a super lightweight, completely waterproof, windproof, shell with awesome temperature regulation and a sweet hood that keeps things from annoying your face. Bonus, it looks good and it’s got some cool features I didn’t know existed. Plus, it will help keep you warm and dry while you climb The Nutcracker. Side Note - The Nutcracker is an awesome route that I was privileged to climb in good conditions. I’m grateful to Conrad and Kris for doing the best job possible equipping and cleaning the route. Let’s Go Champ! I’m not a guy who owns a lot of outerwear but the gear I own needs to perform and be durable. So, when I got my hands on three new RAB jackets I was pretty excited to check them out. The RAB Alpha Direct jacket ended being one I wore the most with a super soft interior and stretchy exterior. Light enough and breathable for the approach but still warm enough to climb in. This jacket seemed to fit so many purposes. The RAB Neutrino Edurance jacket or aka the big warm puffy is an absolute necessity for me as a photographer. I spend a lot of time standing or hanging from ropes trying to get a certain shot. Having a big warm belay jacket makes it easier to get the once-in-a-lifetime shot. I appreciated the extra length this jacket has in the back. It pulls down over the back of your harness to keep the wind out of the inevitable weak spot. Not only are the chin areas covered in soft materials but the pockets are also lined. The extra-large hood zipped over my helmet and kept the wind at bay and really kept the heat in. Being very light and packable makes the jacket an easy choice for all climbing and photography trips. The RAB Latok Alpine jacket was an excellent at shedding water and blocking the wind. The armpit zips could be unzipped almost the complete length of your arm and worked amazing to regulate temperature. As with all the RAB jackets, the Latok had soft fabric patches around the chin/zipper area which is a great detail often overlooked. Providing athletes, demo gear of the best stuff a climber can find, knowledgeable reps and overall constant stoke our Supporting Sponsors are the heart and soul of the Bozeman Ice Festival. To launch our new Blog feature here on our web site, we are featuring our long-time sponsor RAB with a gear review and photo essay from two Hyalite denizens Tate Dunkel and David Wells on their recent journey up the Hyalite testpiece, The Nutcracker (4 pitches M9, WI 5). During their ascent, they wore the jackets you will be able to demo at the upcoming 21st Annual Bozeman Ice Fest, December 6-10. Stop by the Emerson Ballroom any night to visit the fine folks at RAB and check out these killer products. If the stoke is just too high and you can’t wait, join BIF and RAB on Tuesday, Dec 5th at the Lockhorn Cider House in downtown Bozeman for a free special screening of “The Place of Gaels” featuring the birthplace of modern water ice climbing, Scotland.